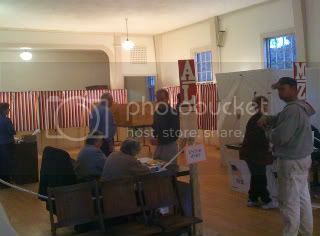 I asked my dad to take some pictures and be more osbservational than usual when he went to go vote and he was! My hometown is relatively small, and in a rather rural environment and so getting through the polls wasn't hard at all. He said he didn't have to wait at all and that everything went smoothly. According to the police officer there to oversee traffic and the actual voting, there was a steady stream of voters all day and that it wasn't extremely chaotic. The hometown is the kind where everyone knows who everyone is and so they also sort of know what sort of politics they follow. There were signs but no one was approaching people at the last minute to sway individuals, and no one was coaching voters and telling them how to vote. The signs themselves were drastically different than when I was voting earlier. The college campus was full of Obama signs, shirts and supporters and was (almost) completely lacking any support for McCain or other Republicans. But my hometown of Kensington had a good mix of the two, often leaning towards support for McCain so it'll be interesting to see how the votes come out when all of the votes come through. Nervewracking, but still interesting. 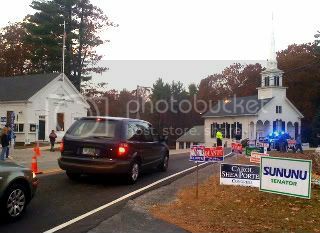 I was like WHAT SUNUNU SIGNS?? Haha. I live in New Hampshire too. I live in Nottingham, and I work in Exeter. So we're pretty close. Haha. I too didn't have any issues voting either. It took about 5 minutes for me to go in and out. The situation was the same--no people out trying to force people to vote either way. Just two tables set up outside with democrat and republican supporters. Quiet. Easy. Successful! It felt so good to vote in my first national election. Hooray!